After spending the past five years trying to turn live musical theater into a TV movie, NBC finally figured out that the best way to present live musical theater is as, well, live musical theater. 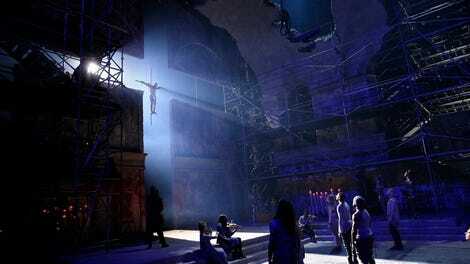 Billing Jesus Christ Superstar Live as a “concert” turned out to be something of an April Fool’s Day joke. This Easter Sunday broadcast was a full-on, stage-bound production of a musical theater classic. 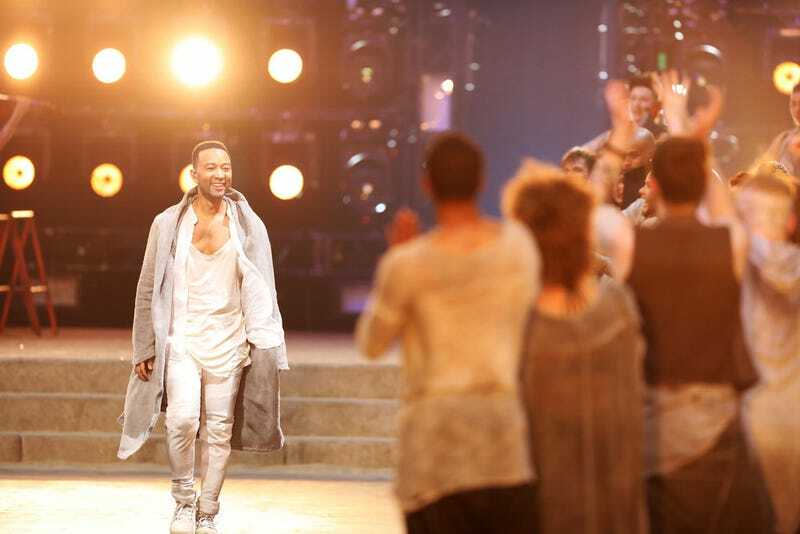 Led by an ethereal John Legend, the show’s talented cast breathed new life into Andrew Lloyd Webber and Tim Rice’s 1970 rock opera about the last week in the life of Jesus Christ. And while the show itself might not include Jesus’ resurrection, this production was a life-giving force for musical theater fans. That it was also 40 minutes shorter than all the previous live musical broadcasts was just icing on the Easter cake. It helps that Jesus Christ Superstar is uniquely built for this kind of network TV broadcast show. The show cares way more about iconography and individual moments than it does about telling a cohesive narrative. So while commercial breaks are never going to help a live musical, they didn’t particularly hurt this one either; there’s no real ongoing action for them to interrupt. And while none of these live musicals—not even the otherwise strong Grease: Live—have figured out how to handle their book (i.e. dialogue) scenes, that’s not a problem for Jesus Christ Superstar because it doesn’t have any. It’s entirely sung-through, with songs that range from insanely catchy to strangely atonal. Like a lot of productions of Jesus Christ Superstar, this version utilizes a modern, grungy, Rent-like aesthetic for its Biblical tale. (Even the beloved 1973 movie adaptation features a framing device about contemporary performers putting on a play in the desert.) But while certain staging choices might be familiar to JCS aficionados (the conceit of reporters peppering Jesus with questions during “The Arrest” is basically a cliche at this point), theatrical director David Leveaux, costume designer Paul Tazewell, and choreographer Camille A. Brown do a fantastic job adding clarity to what can be a nebulous—and yes, very weird—musical. Distinctive costuming helps distinguish the show’s many antagonistic authority figures from one another. And the stripped down staging allowed this production to do what musical theater does best: Tell an exhilarating story using music, dance, acting, and little else. Leveaux even managed to create a compelling group dynamic between the show’s central trio of Jesus, Judas, and Mary Magdalene, even though one doesn’t really exist in the text. Unfortunately, the camerawork by TV director Alex Rudzinski was often at odds with the streamlined performance he was filming. Leveaux and Brown clearly worked hard to create a sense of controlled chaos in their staging and adding quick-cutting, constantly moving camera work on top of that made the whole production look messier and more confusing that it was. A few moments of showy camerawork were genuinely compelling—like the overhead shot of Jesus surrounded by a sea of lepers in “The Temple”—but for the most part the strongest visual moments were ones where the camera hung back and just captured what was unfolding onstage. Thankfully, the musical’s talented ensemble anchored the production even when the frenetic camera was working against them. I was nervous about whether John Legend could combine his singing and acting skills into a true musical theater performance, but he more than delivered. Jesus is a relatively passive character in Jesus Christ Superstar, but Legend’s natural charisma and warmth ensured he was a magnetic presence throughout. Legend also offered a refreshingly original vocal take on the role, bringing a smoother, jazzier sound than past rock performers like Ian Gillan and Ted Neeley. Though Legend didn’t quite bring out the full nuances of Jesus’ big number “Gethsemane (I Only Wanted To Say)” and struggled with the song’s high note too, he managed to convey an impressive amount of pathos in the show’s grueling finale. Elsewhere, the production made a pretty big misstep in casting Alice Cooper for a showy one-song performance that neither played into his strengths as a performer nor gave him a chance to subvert his persona. “King Herod’s Song” is the most overtly fun number in the show, but other than acknowledging that Cooper is famous, the production didn’t do anything with the number, which was disappointing although not entirely disastrous. Rounding out the main cast was Broadway vet Brandon Victor Dixon, a Tony nominee who recently played Aaron Burr in Hamilton (you might know him from the speech he made when Mike Pence attended the show). A staggering vocal powerhouse, Dixon wound up giving a compelling performance that nevertheless didn’t quite mine the full depths of Judas as a character. Particularly compared to the all-time great movie musical performance given by Carl Anderson in the 1973 movie version, Dixon felt just a little too reserved and stoic, particularly during the first half of the show. He made up for that earlier weakness with a devastating performance of “Judas’s Death,” but that sequence could’ve been even more powerful if the groundwork for it had been stronger or if the connection between Legend and Dixon had been a little more charged. To be fair, some of my problems with this production’s version of Judas stem more from its staging choices than from Dixon himself. For instance, while the big eleven o’clock number “Superstar” is traditionally staged as a moment for Judas to confront Jesus, here it felt more like fun production number divorced from the show’s story. It would be wrong to say Dixon gave a bad performance of the song, because he definitely didn’t (again, he’s a vocal powerhouse and an insanely committed physical performer). But the concert-like feel of the number meant Dixon wasn’t able to fully mine the lyrical depth of a song that’s supposed to serve as the show’s big cathartic climax. Similarly, I wish the show’s live audience had been encouraged to react like they were watching a musical, not attending an actual rock concert. Cheering for Alice Cooper’s appearance is one thing, but having the audience scream their heads off after Caiaphas finishes offering 30 pieces of silver interrupted the emotion of the pivotal moment in which Judas decides to accept the money. Yes, there’s an inherent concert-like feel to Jesus Christ Superstar, especially in a production like this one, but it’s still a narrative show. The musical mostly found the right balance in its actual staging, but the overexcited audience too often threw it off. On the whole, however, those are minor complaints against an exhilarating production that once again revolutionized the still-evolving live musical format. Yes, the sound mix wasn’t as clean as it should be and not all the lighting design read as well on TV as well as it should have. But the final sequence of Jesus’ crucifix rising into the air to be surrounded by a larger crucifix of light was a breathtaking bit of stagecraft that blended the theater and concert aspects of the show perfectly. Though its subject matter is as Christian as it gets (give or take a resurrection), Jesus Christ Superstar isn’t a particularly religious show. Instead it’s interested in using its Biblical subject matter to tell a very human story about politics and personalities. What’s the difference between a religious leader and a cult leader? Can good people resist being corrupted by power? Is there room for a leader to be a flawed human being? How do you challenge the status quo without being destroyed by it? Despite the show’s 1970s sound, those are timeless questions to be asking. And even better, Jesus Christ Superstar Live In Concert asks them with panache, conviction, and very little self-righteousness. That’s a pretty groovy, moving way to end Easter Sunday. After fantasy casting Norm Lewis in just about every live TV musical, I kind of can’t believe it actually happened. Unsurprisingly, the Broadway vet absolutely slayed as Caiaphas. I’ve always found Annas to be a pretty forgettable role, but Jin Ha really made him standout. Erik Gronwall as Simon Zealotes was another highlight. On the other hand, I wasn’t a fan of Ben Daniels’ take on Pontius Pilate, a role that’s written with more complexity than Daniels played it. Brandon Victor Dixon giving the “Wakanda forever” salute during his bow was pretty great. I didn’t care for the “backstage camera” that occasionally popped up during the commercial breaks. I don’t want to see actors out of character during the middle of the musical I’m watching. For a different, although not entirely dissimilar, live production, I highly recommend the 2012 Jesus Christ Superstar Live Arena Tour featuring Tim Minchin, Mel C (a.k.a. Sporty Spice), and Ben Forster, which is available to rent on most online platforms. Here are my only slightly tongue-in-cheek suggestions for how I think Jesus Christ Superstar could be improved as a show. Next on the live musical docket is Fox’s Rent: Live in January 2019. Try not to let the headlines and breadlines blow your mind before then.